A compelling compilation of stories and strategies from the heart about ordinary people doing extraordinary things to create a more caring and connected culture for our kids and ourselves. From the mom in Sundance, Wyoming, to the principal of an inner-city middle school in Baltimore, Maryland, to the teenagers in Orlando, Florida, these stories all have one thing in common: each is about the desire to create a culture that cares more deeply for our most important and valuable resource—our kids. Based on the six circles of influence, it shows how one positive act ripples throughout life. "I would ask everyone who ever comes in contact with kids and cares about the world they live in to read this book! It's fantastic. 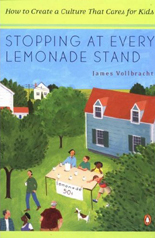 Empowering and positive about how we all can bring change to this world, Stopping at Every Lemonade Stand is the best book I have ever read on creating real change in our children's world. 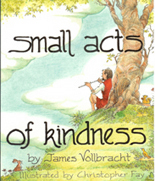 "Author Vollbracht offers hundreds of ideas in this book about how individuals can bring change in simple ways. He encourages readers to take simple steps that lead to stronger neighborhoods and communities. He isn't asking for the moon here; he is talking about saying hi to your neighbors, learning their names. The book is filled with inspiring stories of things that are already working all around the country. He is asking us to notice what is right with our world and support that, rather than always focusing on what is wrong. His point is well taken. Why do we pay so much attention to the minority of children who use drugs in middle school? Why not focus on the fact that the majority of kids don't. Let's work on making it cool to be drug-free by noticing and empowering the kids who are. And by acknowledging all the ways our kids contribute to this world, not just through academics and athletics. Every child has something to give! Vollbracht so eloquently makes the point that our children want our attention and will do anything to get it. Why don't we give them the attention for all that they do right instead of the little they do wrong." "This is a fabulous book. I know it is going to make a difference in my life. And I am betting that it will in yours too. Let's do this! Read the book, try out a couple of ideas. Our kids deserve a better world." In 500 B.C. Confucius presented a social model based on virtue and equated it with power. He proposed those who were the most virtuous should rule, and because he was rejected by the ruling class, he created a traveling school teaching it was through the heart that all great change would come about. 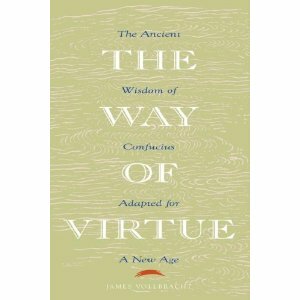 Voltaire was so impressed with Confucius' social model he recommended it be adopted by all of Western Europe. Set in short vignettes, the teachings of Confucius come alive for Western audiences, and demonstrate how his approach is just as applicable today as it was 2500 years ago. Before the movie "Pay it Forward", was Small Acts of Kindness, which shows how one small act of kindness ripples through all of life and results in a surprising and moving great act of love. Small Acts of Kindness has delighted young and old alike, and demonstrates that even the smallest of acts, if done with kindness and love, can have a transformative effect upon others. "Celebrating the power of kindness, this charmingly illustrated book, Small Acts of Kindness, shows children how one small and loving act has the most amazing power and potential. "Intended for pre-school children through eight years of age, this inspiring little book offers a traditional message filled with spiritual richness. Small Acts of Kindness leads us willingly from one boy’s small hug to the power of God’s love for each one of us. Parents and children alike will be inspired by this timeless story." A timeless tale cast in China of an old man who teaches a young boy that what you send out on the river of life always returns. Sun Li, a boy from the countryside arrives at the river's edge with plans to continue on to the great city and become wealthy. Having no money, Sun Li asks the old man who guides the raft across the river how he might pay for his passage, and the old man replies, "Cross with me three times and your passage will be for free." Unknowingly, Sun Li embarks upon a journey that will change his life forever. Read live over National Public Radio, Her Father's Garden tells the beautiful story of a young Tibetan girl, who inspired by her father's dream, transforms her entire village. Born on a morning when a pure, white songbird sang the most beautiful song, Mi Shan, daughter of the Innkeeper, comes to sing of the beauty of each of the villagers, who are transformed in the remarkable closing scene. Illustrated by Janet Brooke, Her Father's Garden whispers of a promise: the promise that we can loved for who we truly are.